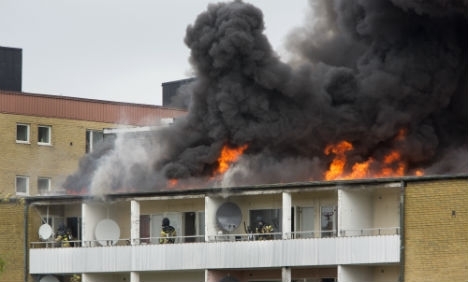 A five year girl has died in hospital following a serious fire at a tower block in Rosengård, Malmö. Nine people, including six other children, were rushed to hospital as a result of the blaze. Both the girl and her mother were found on the sixth floor of the building in an apartment and were immediately rushed to a nearby hospital. Despite attempts to save the girl’s life, she died in hospital. Her mother’s injuries are reported to not be life-threatening. Police sources said the mother and daughter were found in the apartment where the fire had started. The alarm was raised at 6:49am that a tower block was on fire in the area. Emergency services were quickly on the scene and evacuated the building, while fire fighters attempted to tackle the flames which had spread across the sixth floor. “The fire started in an apartment or on the apartment’s balcony. After that it spread to the building’s loft. But what caused it is still unclear,” Mats Nilsson of the southern emergency services told the Expressen newspaper. It took the firefighters several hours to control the flames and by 10am smoke was still smouldering from the building. An eyewitness told local newspaper Sydsvenskan that they awoke to hearing screams from the building. Several residents were rescued from the burning tower block, making their way down via a turntable ladder truck. News agency TT reported that nine people were taken to hospital, with other media outlets speculating that the number was higher. Those hospitalized were suffering from smoke inhalation, while many others were treated at the scene. “It’s about seven children and two adults. I don’t have the exact injury situation but we have a patrol at the hospital,” Marie Persson of the Skåne police told TT. The authorities are currently working to find temporary housing for the people affected by the blaze. Police do not yet know what caused the blaze but haven’t ruled out arson. “It is too early to say,” Persson told Sveriges Television (SVT). Rosengård, which is four kilometres outside Malmö city centre, has frequently made headlines for crime and integration issues. It is also well-known for being where Swedish football superstar Zlatan Ibrahimovic grew up.